Rumours that my local pond was to be drained down for work on an undermined pathway, were confirmed, when I found my way blocked by builder’s fences on arrival for an afternoon of carp catching this week. 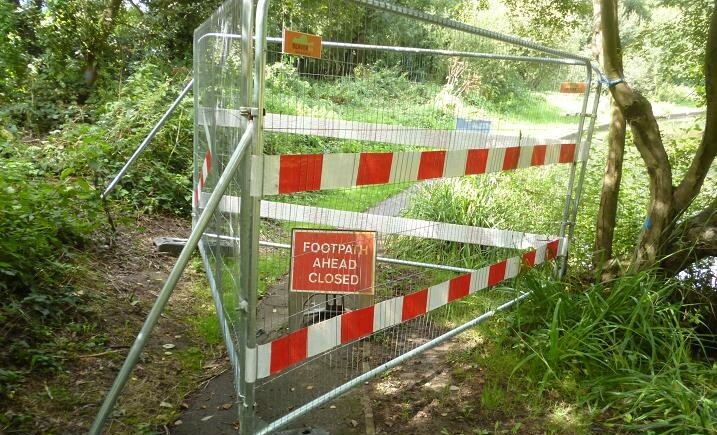 The fences extended to the far end of the pond, which still had open space and having invested time and energy walking to this point, doubled the distance with a detour through a nearby wood to access the recreation ground. Being the school holidays, all but one swim were occupied, this one a parrot cage with an overhanging tree and an impenetrable bed if lilies. Intending to fish the pole, the overhanging branches would not be a problem, as I would be shipping the pole back to only 2 metres to land my fish, while intending to use my heaviest elastic, to a 6 lb line with a 5 lb hook link attached to a size 14 hook, in an attempt to haul any wayward carp out of the lilies, which has claimed too many of my better fish in the past. 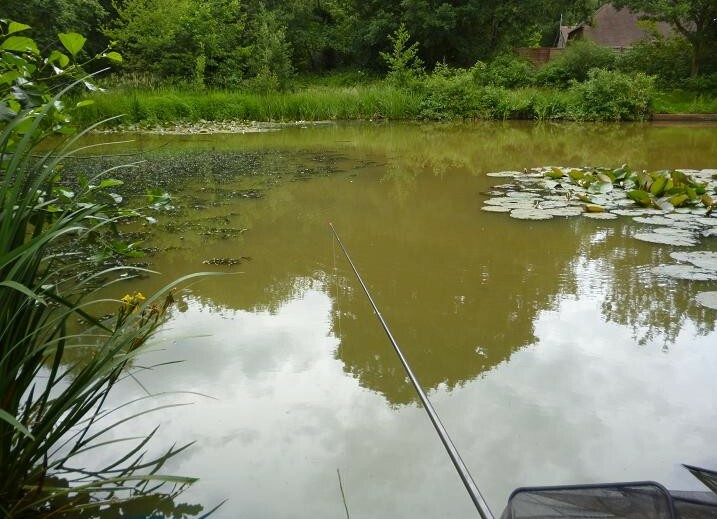 If I’d had access, my ideal swim would have been the one opposite, drawing fish out to a baited area beyond the lilies. 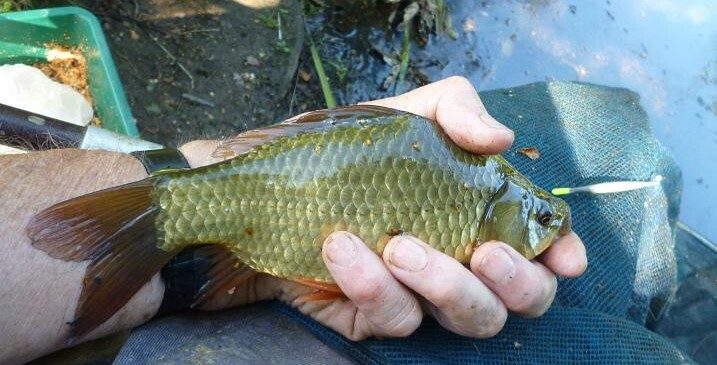 Trying to avoid the plentiful rudd, the plan of attack was no bread based ground bait, but a bed of curry flavoured hempseed, with loose fed cubes of Spam luncheon meat, also dosed with curry powder, over the top and on the hook, feeding an area 7 to 9 metres out, before tackling up. First cast in, the float slid away and the elastic bounced with a quality rudd. So much for the plan! 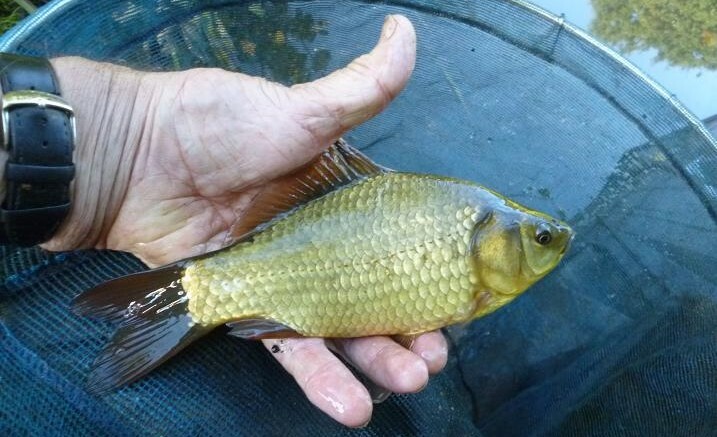 My faith was restored on the following cast, when a dithering bite, that drifted slowly beneath the surface, resulted in the elastic stretching out beneath the lilies, before a perfectly formed crucian carp came to the net. That first hour ran like clockwork, only putting in a few grains of hemp every other cast and no loose fed meat, the float kept going under, a small tench, crucian, or common carp taking the 6 mm cubes offered at the edge of the lily pads every put in. A lift of the float, that shot sideways into the jungle of pads, was the beginning of a tackle test, my pole bending in an arc, as the elastic followed the float deep into the tangle of roots. Keeping my pole flat to the water, the red elastic eventually defeated the runs, the common carp making a break for the open water, each charge getting shorter, until it was ready for the net. 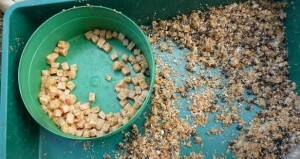 The surface was now a mass of churned up mud and bubbles, which had put the other fish to flight, the next half hour being barren, with the occasional half hearted dip of the float, not even the small rudd seemed interested.Soon desperate for bites, I mixed some bread and ground carp pellets with the remaining hemp and balled it in, cutting the cubes smaller with scissors, also scaling down to a size 16 hook to 3 lb line. 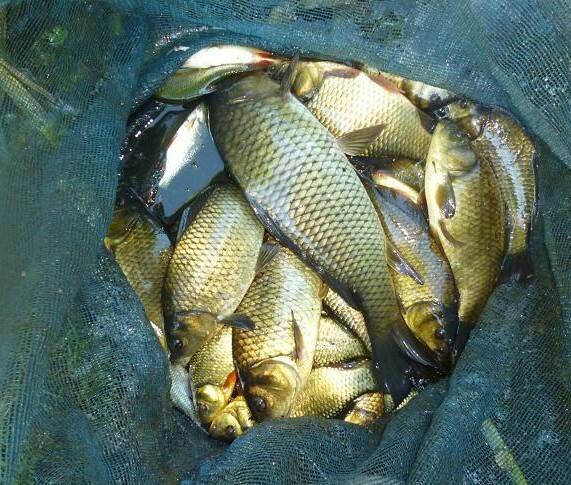 The response was immediate, with a decent crucian making off with the bait, the juddering fight briefly taking the fish under the lilies again, before coming to the net. This pond holds a mixture of commons and crucians, plus a variety of hybrids of the two, some with fins that span from bright red to black. At one time I had collected a gallery of onlookers, as the net came out at regular intervals, demonstrating the efficiency of the pole over rod and line, giving them a grandstand view, when another decent common carp ran away with the bait, stretching the elastic to it’s full extent. There was a sigh of relief all round, when this one was landed, one of my fan club obliging with the camera. The next cast, the float zoomed away again, bumping the pole top, as a bigger common hooked itself, first taking elastic across the pond and I added two more lengths to the pole. My hopes of keeping this fish in the open water were dashed, as it turned relentlessly back toward the lilies, pushing them aside as it dove deep among the leathery pads. For five minutes, I was still in contact, the fish pulling out elastic, then easing back and was confident I would get it out, giving it slack every time the line went solid, for it to start to move off again. Eventually it all went solid with no sign of movement and I pulled for a break, and was relieved to ping the rig back less the hook. 6 pm had been my intended pack up time and with just 15 minutes left, decided to return home early for a change. With fish like these only a short walk from my home, it would be a great pity if the bank reconstruction results in a “fish rescue” that changes the balance of this pond, which proves a training ground for young anglers, while boosting the egos of the not so young like myself. This net weighed in at 14 lbs and did not include one of my bigger carp, that managed to jump ship, just before this picture was taken. I was enjoying a day off, sitting in the sun reading a newspaper, when the call came. “You’ve got to get over here! It’s like Watership Down in my paddock. I can see fourteen rabbits out there right now. Bring your rifle over as soon as you can!” I was miles away at the time, not due back until the the next day and agreed to visit the following afternoon. This was the man, that had called me in two years ago to deal with his rabbits, which I did, getting them down to low single figures, putting my head over the fence from time to time to get the occasional straggler. Then he put a nervous horse in the field and the shooting stopped. I’d shrugged my shoulders and warned that it wouldn’t take long for them to become a menace once more. 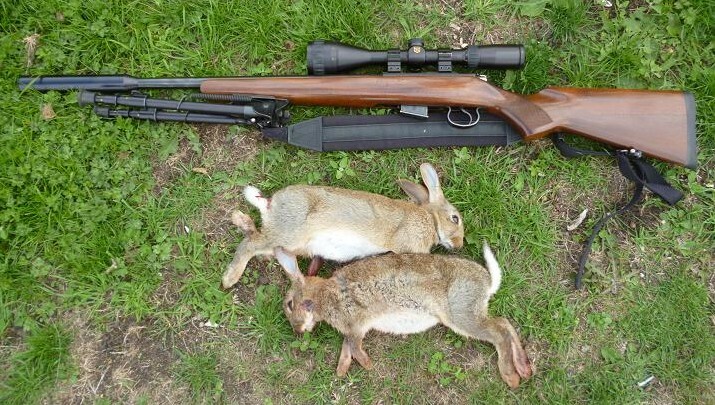 They were on their way to ruining the grass again, when I visited a month ago, putting a large dent in their numbers, but this sounded like a major stake out job, taking the CZ .17 HMR and the Magtech .22 semi auto for good measure. I arrived, armed to the teeth, to find an empty paddock and not a rabbit in sight. I waited at the fence for ten minutes, but nothing came out, apart from the farmer. He was shamefaced, apologising for getting me over on a fool’s errand, but that’s how it goes. The day before had been still and warm, while now a cool wind was gusting across the fields, blowing in a few heavy showers. They don’t like rain, or too much wind. I walked over to the far corner, between the fence and a small hay barn, laying out my padded rifle bag for added comfort, to lie prone with the HMR on it’s bi-pod, sighting along the fence, with a clear view to the far end of the paddock. At first I was quite comfortable lying there, watching the world go by, several times tempted by fat wood pigeons to take their heads off, but knew that one shot would keep the nervy rabbits in their burrows for even longer. I was getting fidgety, when a slight movement at the far end of the paddock caught my eye. A juvenile rabbit had edged out of a bramble bush to begin feeding close to it’s bolt hole. I checked the range setting on the scope and allowed for the wind, which was gusting from right to left. At 120 yards, this was not a guaranteed shot, the rabbit jumping high in the air, to then tumble over with a broken rear leg, the bullet hitting well off target. Another was chambered and fired, this time stopping the struggle. This is the achilles heel of the HMR, the tiny .17 inch dia. 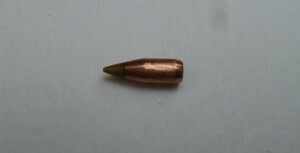 bullet only weighs 17 grains and is easily blown off course in gusty conditions, a steady wind being easier to allow for. I stayed put and waited. At that range, the rifle report would have been minimal and was hoping that more would follow. As they say “Hope springs eternal” and it seemed like an eternity, before a rabbit crept out from the brambles. Another juvenile, it conveniently moved round to give me a side on shot, aiming at at the upper body for safety, to watch it slump forward without a kick. In an hour nothing had emerged along the fence line and after a further ten minute wait, gathered up my kit and walked over to pick up the two rabbits. This was not the result I’d been expecting when I set out and have learned my lesson in the past, to take descriptions of hoards of rabbits with a pinch of salt. My attention was now focused on the bramble bush, which was loaded with blackberries, it being unusual to see such abundance in early August. To add value to the trip, a spare bag was soon being filled with the plentiful ripe fruits of the field, taking occasional looks along the fence, as I busied myself with this new distraction, gathering about 3 lb in no time, enough for several pots of jam. Nothing else had come out of hiding and decided it was time to go, meeting the farmer at the van, showing him the bag of fruit. “Want some apples to go with those?” he said, pointing at his overloaded Bramley apple trees. 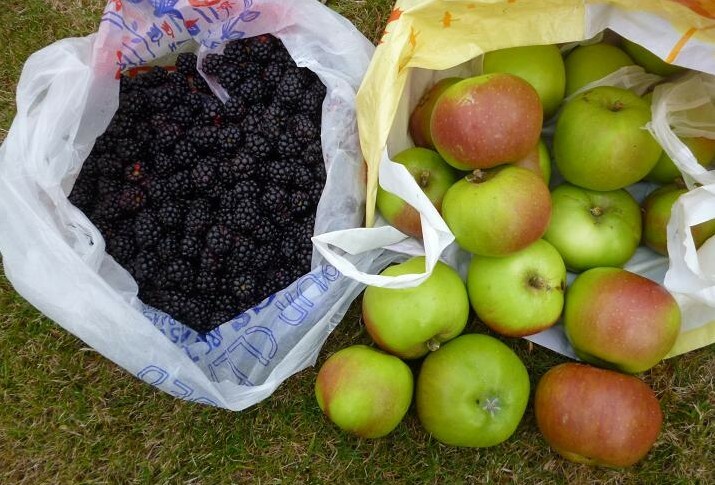 I didn’t need asking twice and was soon filling another bag with ripening apples, the ideal companion for blackberry and apple jam. Returning from my brief scrumping expedition, a look back revealed a lone rabbit sitting out beside the wire fence 80 yards away. 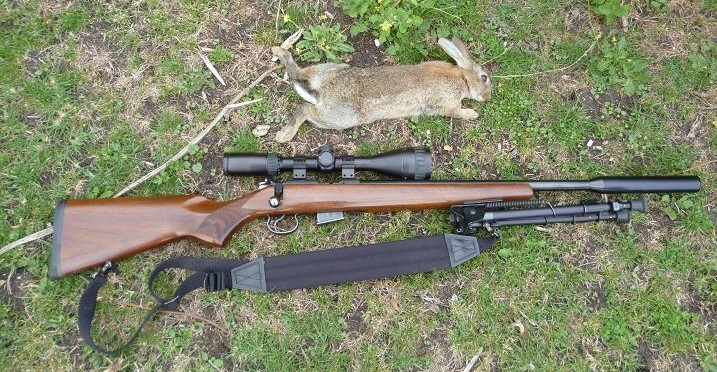 Keeping his distance, the farmer waited for me to return with the rifle, then watched as I rested the it over the garden fence and dropped the rabbit. Having only used shot guns, he is impressed by the range and accuracy of the HMR, letting out a “Whoop!” at my success. Three rabbits is better than two and another visit is scheduled soon. In the meantime 13 lbs of jam have been made and distributed among friends and family, with enough fruit left over for my favourite, a blackberry pie. 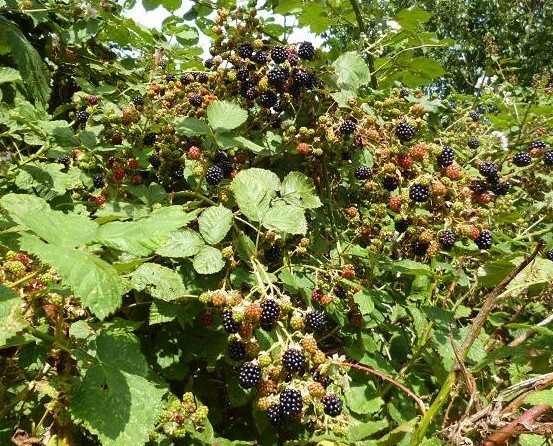 Blackberries are one of nature’s freely available bounties, even in cities there are wild corners where brambles grow, producing their fruits throughout the month of August. I am fortunate that my country pursuits give me access to land not visited by the general public, where the fruits are able to achieve their maximum size. 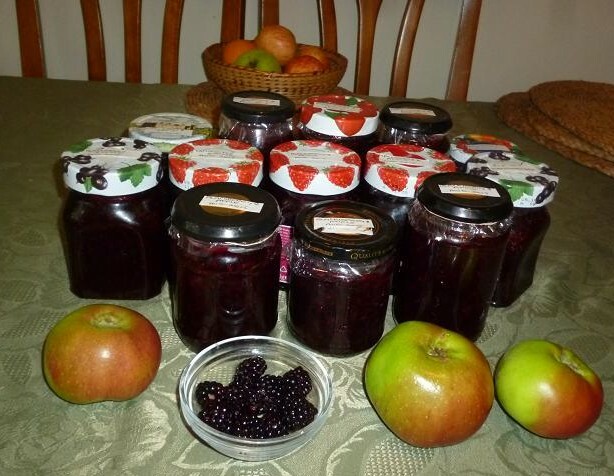 A recent visit to a farm orchard provided me with the main ingredients for blackberry jam, fresh, fully fruited berries and unripe sour Bramley cooking apples. 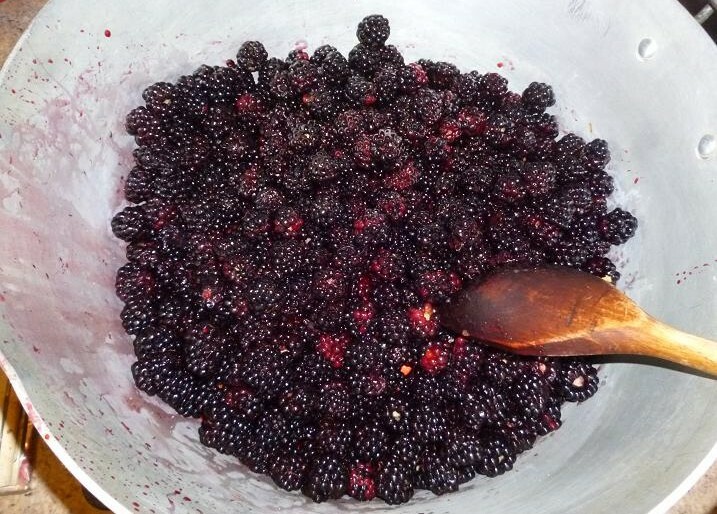 Place the blackberries in a large saucepan, or preserving pan with 1/4 pint of water and stew slowly to bring out the juice and soften. Cut the apples into thin slices and stew slowly in 1/4 pint of the water, until soft. 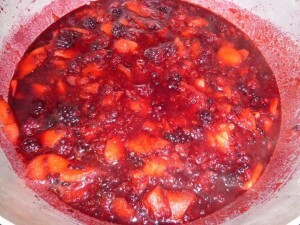 Add the apples to the blackberries and mix together, then pour in the sugar, turning and stewing, until the sugar is fully dissolved. Rapidly bring up the heat, stirring the mix constantly to avoid burning the jam. This will liquefy the mix, the bubbles will growing bigger and noisier. This is a sign that the setting temperature is close. If a cooking thermometer is available, test the temperature at this point. When a temp of 220 F or 104 C is reached, the setting point, remove from the heat. If no thermometer is available, place a dessert plate in a fridge before starting the process, so that it is cold, when the noisy boil begins. Remove the plate from the fridge and drip some of the hot liquid onto the plate, then return it for a minute to the fridge. The jam on the plate should have produced a skin, which will wrinkle, when pushed and will not stick to the finger, when lightly touched. 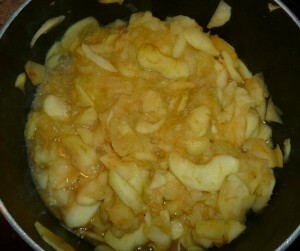 Continue to stir and boil the jam, testing at intervals, until this condition is met. Another ready sign, is that the jam on the spoon will begin to congeal, watching for signs of drips solidifying. A thin sugary scum will have formed on the top of the jam, which may be scraped to one side, before pouring the hot liquid jam into warmed, clean jam jars, using a jug. Pour a small amount into each jar and swirl round, before completely filling, to avoid breakage. Once filled, the jars need to be sealed, ideally with readily available kits, which consist of a grease proof disc to drop onto the still hot jam, a larger cellophane disc, which is placed over the open neck of the jar and a rubber band, which is then used to retain the cellophane disc over the neck. If lids are available, screw these on too. Belt and Braces. Don’t forget to label your jam, name and date. 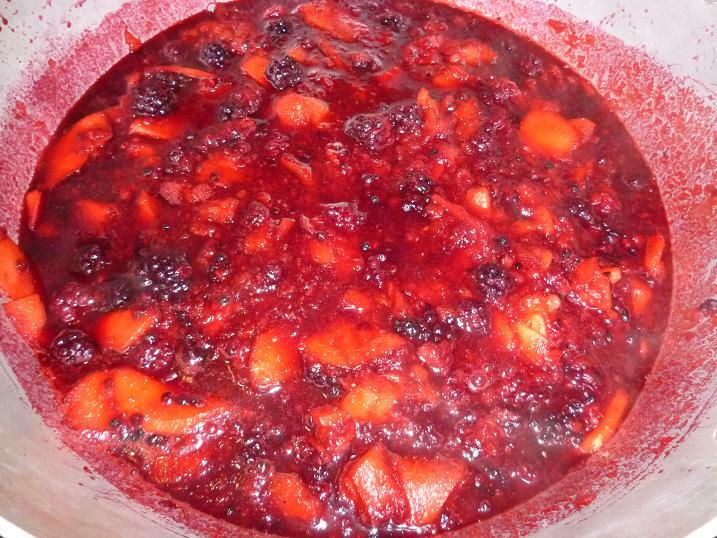 This will avoid mixing up vintages over the years, as jam will begin to ferment, if left for several years. This was the result of my latest jam making session, 13 jars of Blackberry and Apple, with enough left over for a pie. Low water brown trout rise to the occasion. Fitting in a successful evening visit last week to my local trout stream, just before a weekend of heavy rain, I was looking forward to a river full of oxygen, pushing through at a fair pace, when I arrived late in the afternoon, but was sorry to see it barely covering the stones. Unlike last week, nothing seemed to be rising and I followed the right hand bank downstream, over the stile and into the copse below, where I could see that somebody, probably the voluntary bailiff and his helper, had been busy cutting down the Himalayan Balsam, that had previously blocked the path, although the river was still not fishable from the bank, which made all this effort pointless. It was disappointing to think that an organised working party would have cleared the banks in a couple of hours, while also providing a social event for the members. A short email message and the press of a button would have done the trick. Knowing how difficult it would be to fish further down, I turned round and made my way upstream again. Reaching the small weir, a fish was rising below the outfall, while another was active in the pool above and I waded in ready to make my first cast of the evening with a Deer Hair Sedge. With a tree above and behind me, only short side casts were possible, the seven foot rod flicking the fly between the rocks, casting and recasting to avoid drag, adding line a foot at a time, until the trout rose and was on. Only about eight inches, the little wild brown fought round the pool, before sliding into the net. Feeling confident, I waded up to the tail of the upper pool and placed the fly, where the rings had spread. A slight boil, then a take. Yes! A better brown was on, searching out the deeper water, then the roots to the side of the pool. It all went solid. Snagged. I was able to wade up, following the line down with my hand to the fly. The trout was gone, but I broke the root free and retrieved the Sedge. A few false casts soon got the Sedge floating high in the water again, but I’d disturbed this pool too much for any other interest and moved up to the cattle drink. A few fish were showing here too, but proved to be small dace again and as I’d caught a good trout between the trees last week, moved up to another once highly productive pool, that only raised a five inch trout parr, which shook it’self free as I lifted it off the surface. The air was now full of dust, as a combine harvester began to work the field to my left and I ducked back into the trees, more in self preservation than to fish. Wading up through the shallows toward the tail of a very deep pool, the smooth surface broke with a splashy rise, just beneath the overhang of a bush. Had a caterpillar dropped in, or some other terrestrial to be gobbled down by an opportunistic trout? 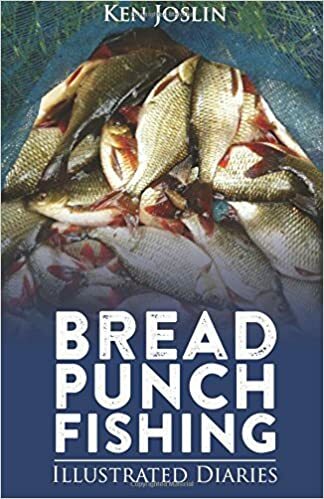 The dust from the passing harvester was now fogging the air and settling like a scum on the surface, as I inched my way along the left hand bank, stopping when the depth suddenly increased, another step would have seen the water up to my waist, too deep for comfort. Pressing hard back to the roots, I began measuring my side casts toward the overhang, when the fish rose again, nudging a spinning fly on the surface, before side swiping it down. Only ten feet away, it should have been easy to place my fly ahead of the fish, but whether I was rushing the casts, or not, the line would not go where I wanted it to go. 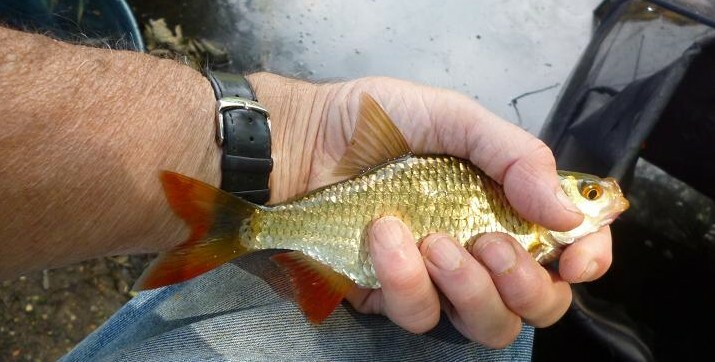 Probably not enough of the heavier fly line was out of the rod. The line landed in an untidy zig-zag on the surface, the Sedge dropping like a stone, creating it’s own ripple and the fish rose up through the middle of the ring and virtually hooked it’self, momentarily standing on it’s head, when the strike stopped it’s forward motion. It went berserk, tail walking and leaping on the short line, while I struggled to keep my rod under tension. A silvery trout, but not a rainbow, it at last dived into the deep waters of the pool upstream, away from obstructions, turning at the shallows, to head back toward me, drawing the brown back to fight under my rod top, until it was ready for the net. This was not a large trout, maybe eleven inches, but it gave it’s all on the light tackle. The Sedge came out in the net and I was able to point the fin perfect brownie upstream, where it kicked away from my grip to sink back to the pool. Mission accomplished, I was back at the van before 6 pm, this visit giving about 90 minutes of anticipation and a few minutes of heart stopping action. 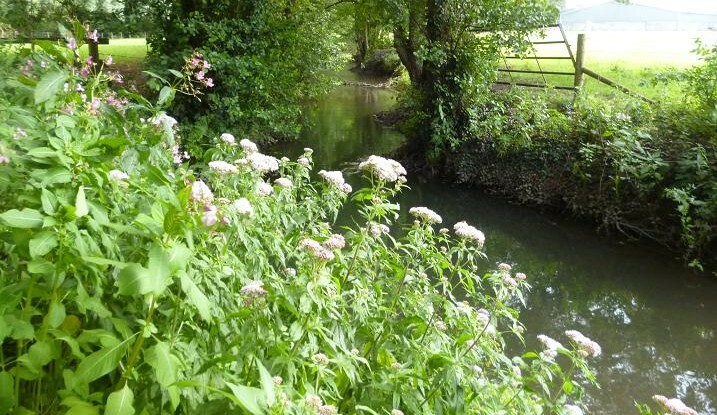 With river levels so low, and the banks overgrown, I have no desire to return for a while, but will try to find time for a late season session in September.